In addition to his installation of new objects, wall drawings and works on paper, most created specifically for whitespace, Pete Schulte has introduced a unique soundtrack to accompany viewers during their visit to whitespace. The First Fifteen Minutes of the Third Hour is excerpted from a three-hour live sound installation originally performed by Andrew Raffo Dewar (soprano saxophone, electronics) and Brad Davis (electronics) in conjunction with Schulte’s exhibition A Letter Edged In Black, which took place at the University of Alabama at Birmingham in 2013. 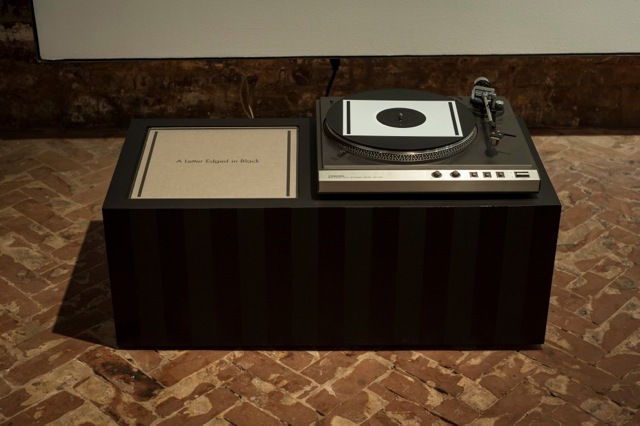 That performance was recorded and subsequently pressed on a 12-inch vinyl record that plays continuously as part of a new sculpture in Schulte’s current exhibition (on view until March 28th). The dissonant and varied sounds produced in The First Fifteen Minutes of the Third Hour create a surreal experience for visitors as they negotiate the unique gallery area of whitespace. In addition to the noises being produced by the musicians, one hears footsteps and faint chatter from the previous exhibition, which in combination serves to effectively and eerily meld the two experiences together. A Letter Edged In Black – the record – is a collaboration between Schulte, Dewar, Davis and Jessica Peterson of The Southern Letterpress. Peterson helped to design and expertly print the beautiful envelope that holds the screen-printed vinyl. The project, which more closely occupies the terrain of a limited edition print rather than a typical record, has been a labor of love – two years in the making. Please contact whitespace for additional information. This entry was posted in Uncategorized on March 6, 2015 by blog814.